Lake Bled is the crown jewel of Slovenia. With a postcard-perfect church crowning Slovenia’s only natural island, a castle clinging to a cliff and a turquoise lake set among some of the highest peaks of the Julian Alps, it’s easy to see why it’s one of the top places to visit in Slovenia. So, wondering what to do in Bled? For such a small town that has preserved much of its natural wonder, there’s a lot of things to do in Bled. Many people take a day trip to Lake Bled from Ljubljana, or even from Venice. But from exploring the clifftop castle to canyoning Lake Bled, you need to spend at least one night to soak in all the best Bled has to offer. Not to missed is a visit to Bled Castle, if for nothing else than the stunning views over the lake and Bled church. Sitting atop a 130 meter high cliff, Bled Castle is the oldest castle in Slovenia and the symbol of the country. After a climb up the steep cobbled walkway (wear flat shoes that grip because the cobbles are very slippery), you reach the ticket window. Entering the castle grounds, you’ll find that Bled Castle is actually several different buildings that almost make up a tiny village of its own. If you’re just visiting for the viewpoint over Lake Bled, go to the left where there is bar and gelataria. Here you can ascend a staircase for a stunning, panoramic view of the lake and Bled island. From here, you ascend up to another platform where the Castle Restaurant is located (the view comes with a high price tag) and the Bled Castle museum. Housed in the baroque rooms of the castle, a display proudly presents one of the most beautiful 6th century findings – a peacock-shaped brooch found at Pristava below Bled Castle. The peacock is known to adorn the Garden of Eden and is often referred to as “the bird of paradise”, a symbol of life and wealth. Aside from the peacock brooch, the museum walks through the history of Bled from the time of the first settlements to present day. 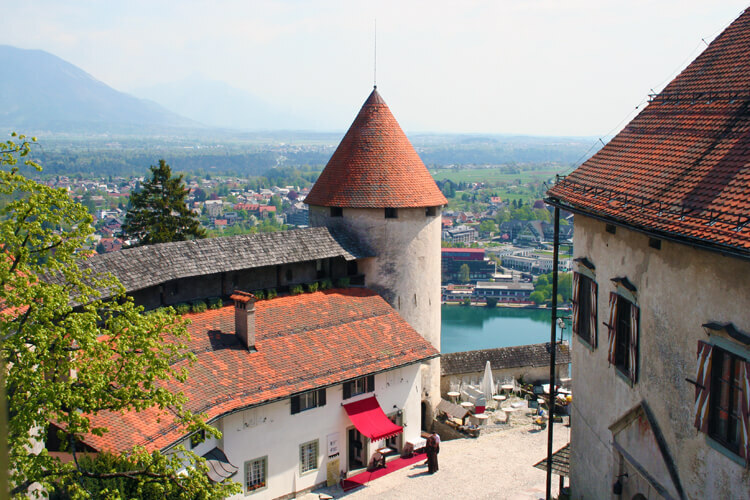 Next, wander down the steep ramp to the Bled Castle Wine Cellar and see a demonstration of bottling wine from oak barrels. Visitors have an opportunity to fill their bottle with Slovenian wine as a souvenir, cork it, wax it and receive a certificate. The castle is open year round. Bled Castle opening hours are 8am – 6pm November – March, 8am – 8pm April – June and September – October, and 8am – 9pm July – August. The Castle Restaurant is an excellent but, as already mentioned, pricey choice. For a more affordable lunch, head to The Panorama Restaurant. Not only does their terrace offer a spectacular view of the castle on the cliff and Lake Bled as you dine, they offer a selection of seafood and a delicious mixture of Mediterranean and Slovenian cuisine on their menu. We highly recommend the Caesar salad, although it’s unlike any Caesar salad we’ve had before. The lettuce is a mix of rocket (known as arugula in the US), radicchio and curly endive with prosciutto, olives, tomatoes, and a dressing that tastes much like the German sour cream dressing. The house mushroom soup, which is a restaurant specialty, comes in a pastry cup as the bowl. It’s outstanding! You also can’t go wrong with Slovenian goulash. 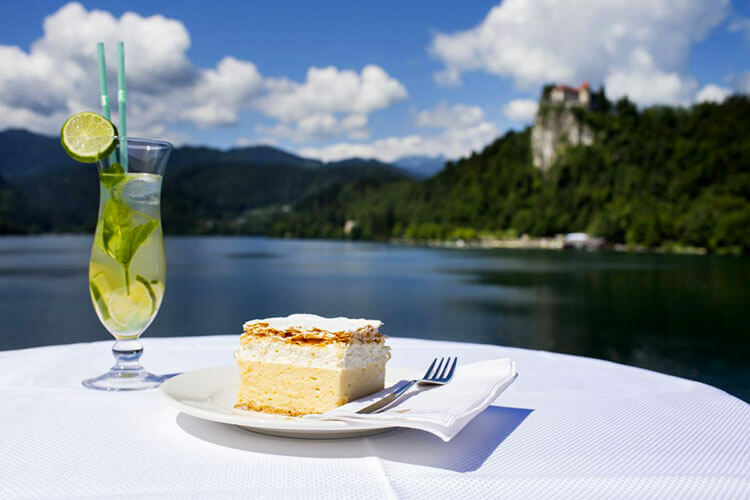 You also can’t visit Lake Bled without trying the original Bled cream cake. Over 14 million of the original Bled cream cakes have been made by the Hotel Park since they invented it in 1953, and the original recipe is still used and made fresh daily for The Panorama Restaurant and The Park Cafe. The famous Bled cake is layers of puff pastry with custard and whipped cream, then topped with icing. It must be exactly 7 x 7 x 7 centimeters and it makes a slight and satisfying cracking sound as you dig in to the puff pastry with your fork. After lunch, take a boat tour to the island (about €15 per person) on a pletna boat, a gondola-like wooden flat boat with two oars – a must do when it comes to the top things to do in Lake Bled. The pletna are unique to Lake Bled and have been used since 1590. Just as in Venice, the tradition of being a pletna oarsmen was handed down from generation to generation. 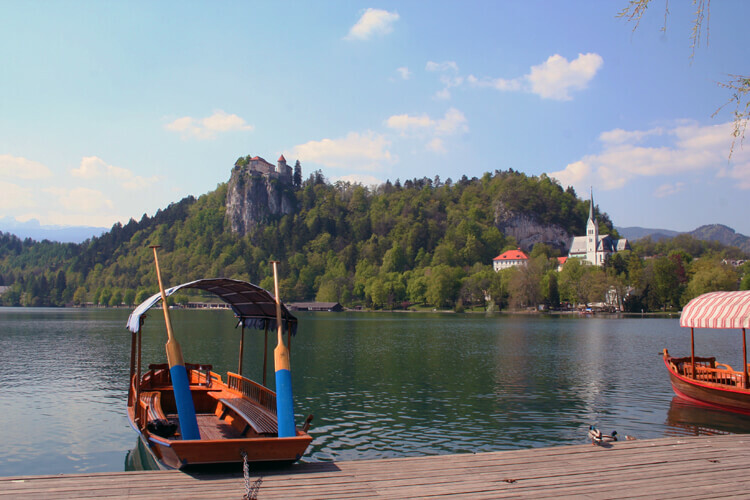 You’ll find oarsmen to hire for a tour, which includes 30 minutes to wander around Bled Island, just under the Hotel Park. Arriving over on Bled Island, you’re first struck by the monumental staircase with its 99 steps leading up to the smattering of buildings on the island. The staircase dates back from the 17th century and has been preserved along with the wall and the rest of the buildings on the little island. Lake Bled Island has several buildings, the main one being the Pilgrimage Church of the Assumption of Mary built in the 15th century. Though the island was inhabited long before. Archaeologists have found traces of prehistoric settlements on Bled Island dating back to the 11th century BC. The very first church mentioned in documents was built in 1142. The Lake Bled church, as we see it today, was renovated in 17th century after several earthquakes damaged it. The church has a 54-meter tall bell tower, which was also renovated after the earthquakes and a lightning strike in 1688. 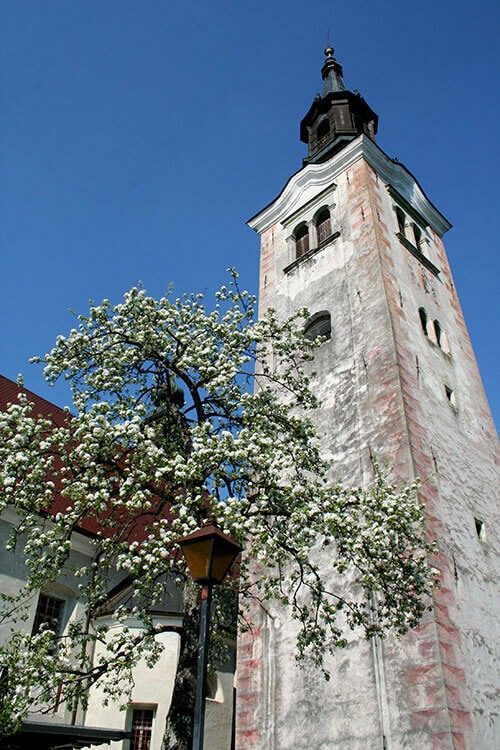 The three bells in the tower were made by bell makers from Ljubljana. You’ll probably notice all the little bells for sale in the same Bled church gift shop. There’s a legend that a rich, young widow lived Bled Castle. She ordered a bell cast out of all of her gold and silver for her late husband, who had been brutally murdered by robbers and his body was tossed in the lake. She ordered the bell to be sent to Bled Island. On the way rowing it over, the bell, the boat and the oarsmen sank to the bottom of Lake Bled during a terrible storm. The widow was so distraught after the incident, that she sold everything, left Bled and moved to Rome to live out the rest of her days as a nun. To honor the widow, her husband and the oarsman that died while transporting the bell, the Pope himself supposedly ordered a new bell to be cast after the widow’s death. That bells hangs in the tower to this day, and it’s said that anyone that has the good fortune to ring it has their wish fulfilled. Slovenians love this legend and celebrate it to this day. Every December 25, divers participate in a ceremony to resurrect the sunken bell. And every February, the bravest of swimmers risk swimming in Lake Bled during the now traditional Winter Swimming Cup. With the long summer days, you’ll also have time for a bit of Lake Bled hiking in the beautiful Vintgar Gorge. It’s located just 15 minutes from Lake Bled. The entire length of the gorge is only about one mile in length, so you can easily hike in and out in under an hour. Vintgar Gorge is one of the most popular natural features of Slovenia and one of the Slovenia attractions you shouldn’t miss. The bridges and walkways make for easy hiking in the 1.6 kilometer (just about 1 mile) long gorge, making is a family-friendly hike (note that strollers aren’t allowed). Vintgar Gorge was discovered by Jakob Žumer and Benedikt Lergetporer in 1891, and just two years later it was opened to the public with a series of wooden walkways and observation bridges. Carved out by the Radovna River, the canyon walls rise 50 to 100 meters (160 to 330 feet) high around you as you traverse the wooden walkways snaking along the canyon. Spray from the rapids and water dripping down from the canyon walls is refreshing on a hot summer day. The trail, which is so easy a walk you can even do it in flip-flops like I did and suitable for anyone, leads past the rushing, foaming waters of the Radovna River to the 13 meter high Šum waterfall at the end of the trail. 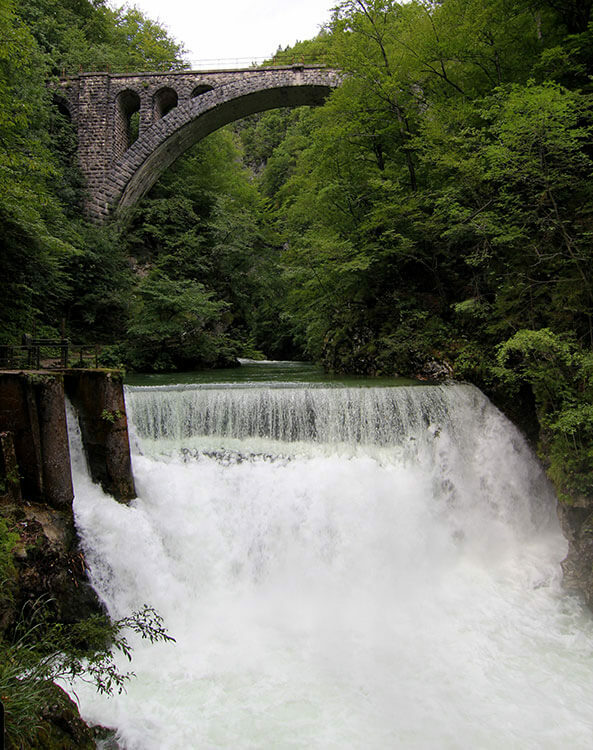 The Šum waterfall is Slovenia’s highest river waterfall and the man-made stone bridge of the Bohinj railway crossing above it is very picturesque. Just before the trail leads to the waterfall, there is a little cafe where you can enjoy a cool drink. Vintgar Gorge is not open year round. It typically opens in May, but check the website to verify the gorge is open for visitors. There is free parking at the entrance. Head over to Grajska Beach to cool off with some Lake Bled swimming after all that hiking and exploring. It’s the only designated swimming area on Lake Bled, but it has plenty of space with 300 meters of beach area and enclosed swimming so you don’t have to worry about pletnas and kayaks. The temperature in Lake Bled ranges from 55°F – 70°F (14°C – 21°C) in summer months. It can be extremely refreshing on a hot summer’s day, when Lake Bled temperatures can soar. The beach is a grassy beach area right below the castle with water slides, thermal pools, a rock climbing wall, table tennis and kids play areas (open until 8pm June – September; admission is €5 per adult and €4 for children under 14 or half price after 5pm). Restavracija 1906 is one of the best restaurants in Lake Bled and a local favorite. 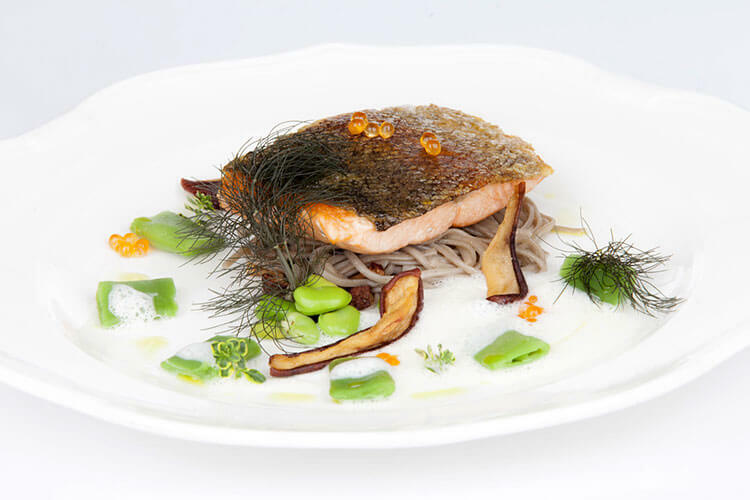 The chef puts a modern spin on traditional Slovene dishes. Try the 6-course tasting menu (must be selected by the entire table) for a sampling of the restaurant’s best dishes. The restaurant also has an impressive wine cellar – the only wine cellar in the area, in fact. The sommelier will select the perfect wine pairings for your tasting menu from their selection over 150 top quality Slovenian wines. Nightlife isn’t our thing – that ship sailed a long time ago. We like to have some good ol’ fashioned fun instead, like mini golf. Bled is home to one of the largest mini golf courses in Europe with 18 holes (open until 11pm April – October; admission is €5 per adult and €4 for children). 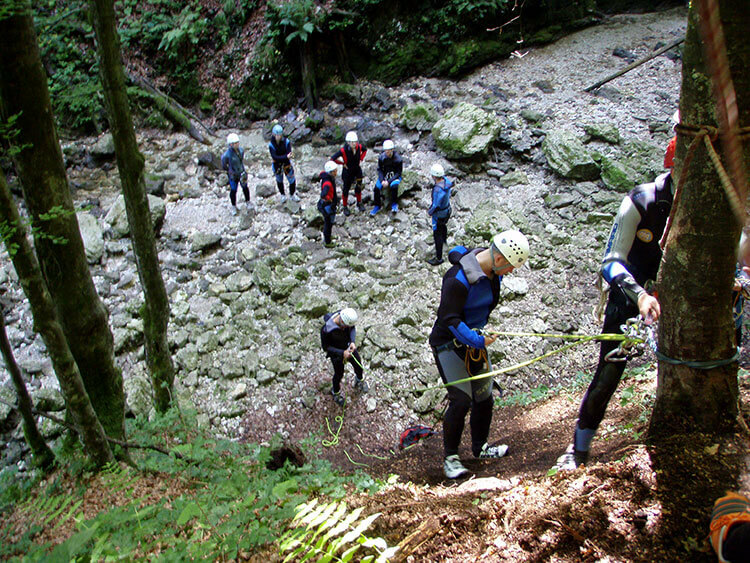 Finish off your overnight trip to Lake Bled with a 3-hour adventure canyoning Bled tour. Climb, abseil, scramble and slide down a series of natural water slides and waterfalls in the canyon during one of the most adventurous Lake Bled activities and one of the top things to do in Slovenia. 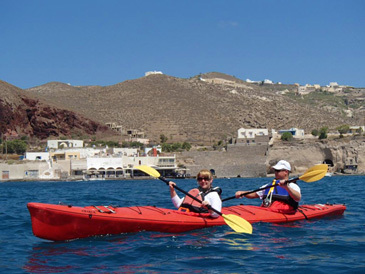 We highly recommend 3Glav Adventures. 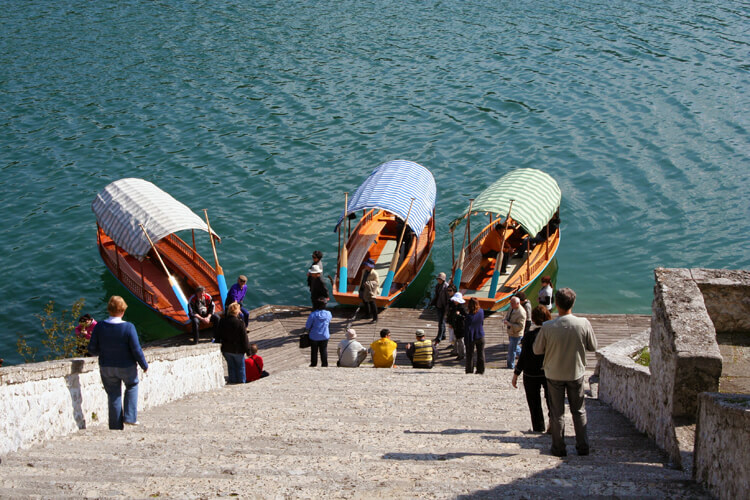 They even pick up from various hotels and campsites around Lake Bled, which is convenient because finding parking in the peak of summer can be a challenge. 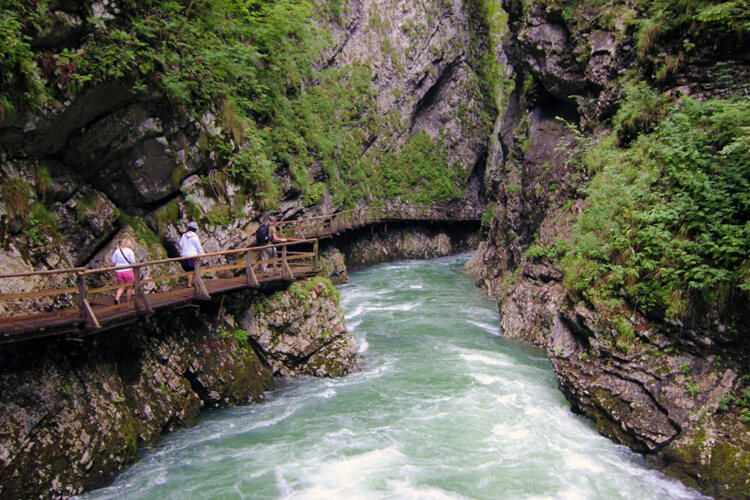 The canyoning is actually in Grmecica canyon, located about a 10-minute drive from Lake Bled. Along the way the 3Glav Adventures guide tells you a bit of history of the area and about canyoning Slovenia in the Grmecica canyon. 3Glav Adventures also provides everything that you need, short of a towel. The first order of business is gearing up. The water is a brisk 48°F even in summer, so that means everyone wears full wetsuits. They also provide thick neoprene socks, oversize shoes, a hooded jacket, harness and helmet for the adventure. You have to hike up about 20 minutes to the starting point for canyoning. Be prepared to sweat a lot hiking in the hot summer in all that gear. We recommend just tying the jacket around you waist to help stay cooler on the hike, and putting it on once you get to the start. The first 10 minutes of the hike is flat, and then the remaining 10 minutes is a climb. Our guide joked that if you want to go down, you must climb up first. Once you reach the entrance to the canyon, you finish gearing up and have a quick lesson on abseiling (or rappelling as Americans call it). 3Glav Adventures takes safety seriously, so pay attention. After the lesson the guides tie off to a tree, where the group repels down to the creek from. This is also where the real fun begins. After walking down the creek a bit, the first obstacle appears: a 3-meter waterfall. The guides tell you exactly where you step and where to jump to avoid any shallow areas that there may be. For the next hour or so you’ll jump, climb, scramble, and rappel your way down the canyon. At one obstacle you jump down into a small hole filled with water, hold your breath and the guide pushes you under an arch. You pop right back up through the hole adjacent to it. Climb out of there and there’s a small water slide to the next pool. There are 6 or 7 pools in all to jump down. After some 6-meter jumps, there is finally a 10-meter waterfall. If you do get scared or just don’t like the jump, you always have the option to rappel down. I’ll admit that at the last 10-meter waterfall I took the easy way down, which included a 6-meter jump just around the corner. The hike back down to the vehicles is far easier than getting to the canyon entrance. It’s only about a 3-minute hike back to the river and then you relax and float down the river back to the vehicles. Don’t get too comfortable as the river is shallow and there will be a surprising obstacle or two you will encounter along the way. Once you get back to the van, you’ll be happy to rip off your climbing gear and wetsuits to soak up the sun for a few minutes before packing up. Canyoning Bled is a truly memorable way to end your trip to Lake Bled! Surely famished again by fun in the sun, don’t leave Lake Bled without stopping by the Lectar Inn for a visit to their Gingerbread Museum. The museum is one of the lesser known things to do at Lake Bled, but well-worth the stop. Gingerbread making is one of the oldest handicrafts of Slovenia. The family has been making traditional Slovene gingerbread since 1822 and you can see some of their creations as well as taste it in their workshop (open from 12pm – 10pm daily in July and August and closed Tuesdays throughout the rest of the year). If you’re visiting in July, be sure to plan your trip around the annual Bled Days and Night festival. For several days every July, a festival sets up along the promenade with local craftsmen and artisans selling their Slovenian wares. There’s traditional Slovenian food, beer, wine and concerts. 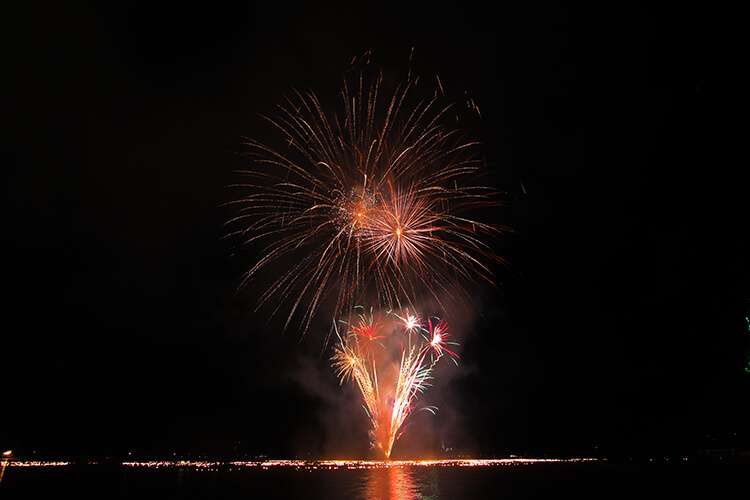 But our favorite part is that the festival comes to its climax with 15,000 floating lights in eggshells being launched from the pletnas on Lake Bled and a massive fireworks show. The aim of the festival is sustainability and the local specialties from the various food tents are all served in biodegradable packaging to create a zero waste event. Situated only 200 meters from the lake in the heart of Lake Bled, Hotel Kompas is set slightly uphill giving it a great view directly across to the castle and of the lake. One of the best features of the hotel aside from the superb location is that guests of the hotel can enjoy the pool year round. It’s set indoors in a glass atrium, which is opened up for guests to enjoy the terrace with castle view in the warmer summer months. The hotel has a total of 95 rooms, including family suites that can accommodate two adults and two children. The rooms are modern, but simple and some have Lake Bled views. Breakfast is included, there’s free parking and pets are welcome at this Lake Bled hotel. It’s one of the most affordable hotels in Lake Bled for all the amenities guests enjoy. 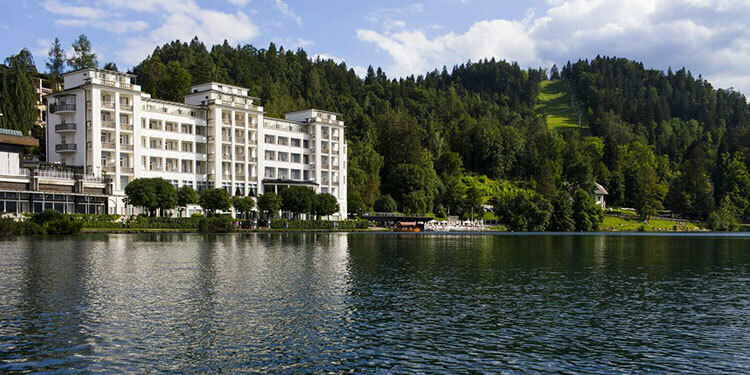 Grand Hotel Toplice is the only 5-star hotel in Lake Bled and situated lakeside just a few minutes walk from Hotel Kompass. The hotel has been a romantic and historic fixture of Lake Bled for more than 80 years. It has it’s own private beach, a thermal pool and a spa and wellness center. The rooms are quiet similar to the decor and style of those at Hotel Kompass, with some rooms having a lake view. Some rooms do also have a balcony. Breakfast is included, parking is free for guests, but this hotel does not allow pets. Also except to pay double the nightly rate at Hotel Kompass for essentially the same amenities, but with a private beach. Hotels aren’t the only accommodation in Lake Bled. You might like to try camping and we recommend Camping Sobec Campground. It’s only a few miles from Lake Bled and is located right on the Sava River. There is a campsite located right at the end of Lake Bled, but it gets super crowded in summer. That’s not our idea of a relaxing camp experience. While the Sobec Campground is still a busy campground, it’s much larger than other campgrounds in the area and gives campers the space to spread out. You can pitch a tent, park an RV or camper with electric and water hookups or rent one of the 10 alpine-style bungalows that accommodate up to six people each for a glamping Lake Bled experience. There’s shower facilities, washing machines, free wifi throughout the entire campsite, and a designated area where you can have a fire or barbecues. 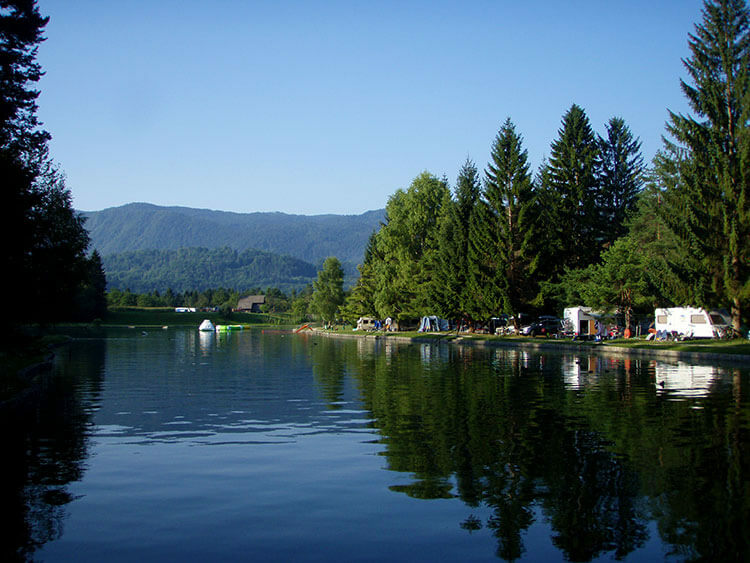 The campsite also has their own little lake, called Sobec Pond, which is fed from the Sava River. The pond is pretty shallow along the shore, so it is a great place to take kids during the summer. They also have a section roped off that has an inflatable pyramid and two floating trampolines for kids to enjoy. From June to September, a lifeguard is on duty to supervise swimmers. There’s also zorbing located at the end of the little lake. If you’re not familiar with zorbing, it’s an inflatable ball that you go inside of and try to walk on water in. Compete against each other like you’re on American Gladiators (remember that show?). You can choose either 5 or 10 minutes in the zorb, but 5 minutes proved more than enough for us. There’s a lot of other onsite camp activities and amenities too. There’s a zip line, mini golf, basketball, volleyball, tennis courts, table tennis and foosball. You definitely can’t get bored at this Lake Bled campsite. There are no direct flights to Lake Bled, as Bled does not have an airport. Lake Bled is accessible by international flights to Ljubljana Airport. Ljubljana Airport is the nearest airport to Lake Bled, located just 36 kilometers away. Shuttle buses are available to transfer from Ljubljana to Bled. Other airports near Lake Bled are Venice Marco Polo, and traveling from Venice to Lake Bled by rental car in around 3 hours. Bled is also accessible via train from Ljubljana and the train station is 1.5 kilometers from the center of Bled. Driving to Bled is easily accessible in all seasons from the motorway. Just be sure to purchase a vignette (required road tax sticker) if driving from neighboring countries like Italy or Croatia. We highly recommend Hotel Kompas. Dogs are welcome and there is an indoor pool and spa that is included for guest use. Free breakfast, wifi, and parking make this hotel a great value. Bled Days and Night takes place the third weekend every July. Lake Bled is definitely pretty but I absolutely adored Lake Bohinj just down the road. Did you visit there as well? Hi Andrea! No, we haven’t visited Lake Bohinj. Sounds like we should visit! What do you recommend we see/do there? It’s just a great place to relax and have a picnic or you can visit the nearby Savica waterfall. I’m a city girl but I loved just walking around the lake and taking in the views. What a beutifull place whilst also being allowed to fly aerobatics low over the lake. YAY! 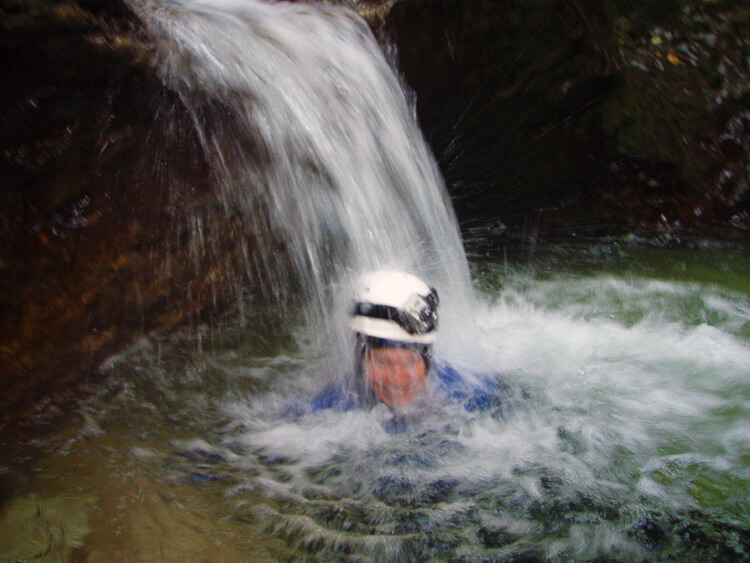 So glad you tried canyoning!! What a rush, hey? Yes Dalene, it is certainly a rush. After hearing you and Pete talk about it last week I started planning the trip immediately. Those photos are so gorgeous! I so want to go to Slovenia. I don’t think I’ve heard one bad thing about it, and your pictures are making me antsy to get there! Thanks, Ali! We have really enjoyed every place we’ve been in Slovenia. It’s a great little country! It was great to meet you two and hang out for the couple of days. Maybe if things go right we can make this festival an annual tradition ? I have never heard about this festival but I now want to go. The images you captured look amazing, to see all of the glittering candles and fireworks lightning up the night sky! I hope that we will make it here one day, perhaps next time we make it to Europe. Only one word to describe the beauty of the images. It’s impressive!!!! This sounds brilliant except for the bit about having to go underwater and then coming up on the other side. I’m very claustrophobic and not sure I could do it. How far under did you have to go? Also, how were you able to get photos if you were in the water a lot of the time? Andrea, the underwater hole was literally only about two feet wide. You guide is there right next to you. You just take a deep breath and duck your head, then he pushes you through the arch and you pop up the other side. You see exactly what is going to happen so I’m sure you’d be fine. As for the pictures I had a GoPro camera as well as an Olympus underwater camera. All I had to to strap the camera to myself so if wouldn’t float away. My goodness, this looks awesome! I’ve been to Lake Bled but on a hot summer’s day, so this is kind of like the complete opposite. I absolutely loved it there, one of the most beautiful places I visited in Europe. It would be great to see a different side to it, so I’ll definitely be adding this event to a future Europe itinirary, thanks so much for sharing! Hi Rebecca! The Bled Night festival is a lot of fun. We recommend the Hotel Kompas. 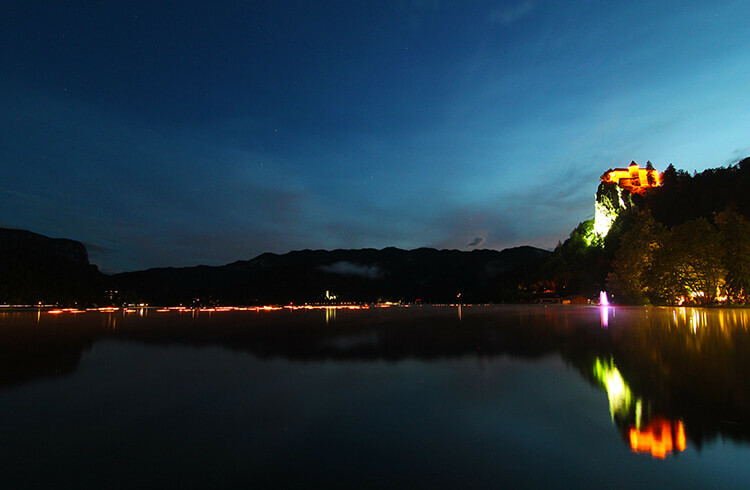 The festival runs for 3 days from July 19 -21, with Bled Night on July 20. 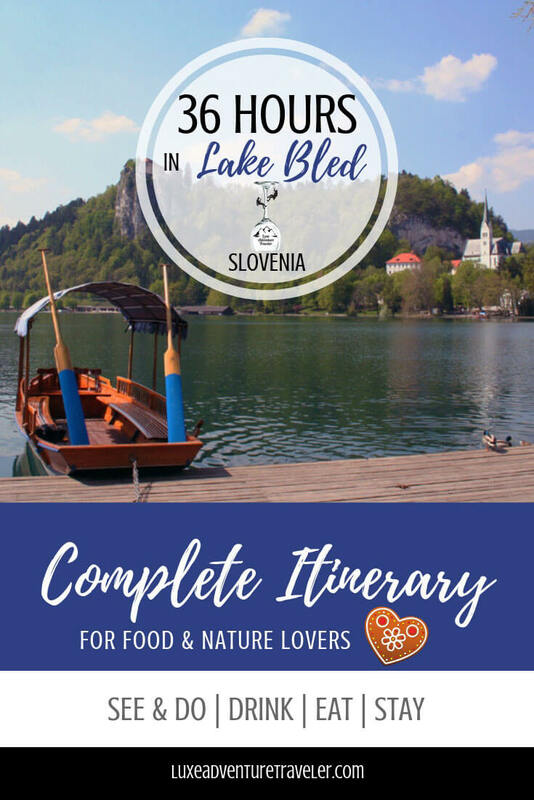 Great to come across your blog and read this post about Bled. I have never been there and yes it is not far from my home town. How funny Jennifer, from your author bio I got to know you are leaving close to Pordenone!?! Still there? Let’s cath up sometimes! ? Hi Michela! Yes, we are still living in Pordenone. This does look like the perfect place to find respite from the summer heat! What a great (and easy) hike. Thanks for stopping by Amy! I couldn’t not check out your blog with narwhal in the title! I had trouble leaving you a comment, but we’ve been to the Paradise Cove Luau in Oahu too. It was way back in 2006, but what a fun way to spend an evening in Hawaii! The water is such a beautiful shade! This looks like the perfect place to spend a relaxing afternoon. It definitely is Dana! Sort of an emerald color that is unique. You’re visiting Slovenia in the fall, Noel? That’s fantastic! How long will you be traveling there? I can feel the coolness from the water as you walk along the wooden bridge. You have some spectacular scenes! I actually never thought about slovenia as a travel destination. thanks for changing my mind 😉 this place looks beautiful! I think Slovenia is still relatively undiscovered for many Americans. We live only about 1 hour 30 minutes away from the capital, so it has been very easy for us to regularly travel throughout Slovenia. Hopefully more people start to discover this beautiful little country! I thought I was giving you a comment and it went on my facebook page. Your photos are absolutely spectacular. Thanks, Ruth! Your comment also came through with Facebook – whichever is your preference. We’re just glad to have you stop by! What a pretty place! Your photos are lovely. I’ll add my “lovely photos” sentiments! Thanks, Patti! Glad to hear you enjoyed them! What a beautiful place and it’s nice that the Slovenians have made it accessible for easy hiking. Our son just visited Slovenia and really enjoyed his time there. 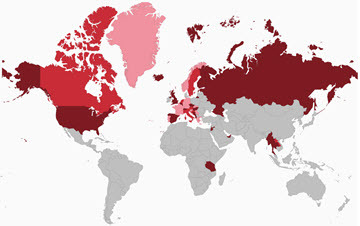 Central, Southern Europe is still a relatively undiscovered travel destination for Americans. It has been added to our travel wish list. Absolutely agree, Suzanne! A lot of Americans flock to Italy and France because they are well-known tourist destinations. We rather enjoy that we can escape the crowds in other parts of Europe, even in the middle of summer. A leisurely walk around a beautiful and refreshing looking gorge! Thanks for taking us along, Jennifer! The gorge truly is a place to have a leisurely hike. Beautiful spot! I love the sound of waterfalls! I can agree the area is seriously undiscovered. Just got back from Bulgaria and was in awe. So much beauty, real bang for the buck and absolutely no North Americans. Bliss. Sonja Lishchynski Bulgaria sounds amazing! We haven’t made it there just yet. Great photos! We hiked Vintgar last month and absolutely loved it (along with the rest of Slovenia). Thanks for letting me re-live that afternoon. Looks incredible! I’m going on a hiking tour in Slovenia in October. Hope that we will be heading here. I would also love to try canyoning here! I’ve still got to give it a go, Laurel! You should come visit and we can try it together! Beautiful photos! Vintgar Gorge looks like a great part of Slovenia to visit. Thanks for sharing! It’s easily combined with a trip to Lake Bled, which is another incredibly beautiful spot in Slovenia. Looks like you really had a blast at panorama. The lake images with Bled Castle at the background and those colorful clouds really look amazing! Thank you Rok! We were just talking about maybe taking a drive tomorrow to see Bled all covered in snow. Awesome photos ! Reminds me of my trip to Slovenia a good few years ago. Lake Bled was so beautiful! It’s a wonderful part of the world, isn’t it! I had an EPIC time in Slovenia, and your photos made me re-live the great experiences I had. I didn’t get to visit Vintgar Gorge this time, but now I have a(nother) reason to go back. It looks amazing! That’s great to hear Miriam! What was your favorite thing you did or place you visited in Slovenia? I just got back from Slovenia and my first canyoning trip (though with a different company). I’m not sure why I thought it was a good idea since I hate having my face underwater but I’m really glad I went all the same. We did a different canyon but our guide took us to see the final waterfall at this one. It had been raining a lot so the water was rushing. Regardless, I don’t think I could’ve done the 10m jump.